The Herschel Space Observatory - artist's impression. 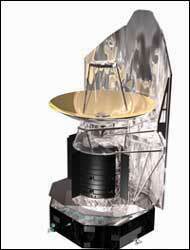 Herschel, an infrared space observatory, was launched on an Ariane 5 space rocket from French Guyana on May 14, 2009. After a few short weeks it reached its nominal orbit 1.5 million km away from the Earth, facing away from both Earth and Sun. From this vantage point Herschel had pointed its giant telescope not only towards our own galaxy, the Milky Way, but also at very young galaxies in the far reaches of the universe. Herschel’s useful life was limited to almost four years, which kept infrared astronomers exceedingly busy. The brief lifetime was due to the fact that Herschel consumed its liquid Helium to keep its science instruments cold. After the coolant ran out on April 29, 2013, Herschel's three instruments, which only function close to absolute zero temperatures (-273°C), became useless. Stars as seen through the Hubble Space Telescope. During its short but intense life Herschel allowed astronomers to see far-infrared and sub-millimeter light from stars, galaxies, and other matter in space, such as cold and dark material between stars. The primary focus of Herschel's mission was to determine how stars and galaxies were and are born. Star formation occurs in our own galaxy (the Milky Way), and Herschel examined closely regions where dust and gas is in the process of turning into a new star. 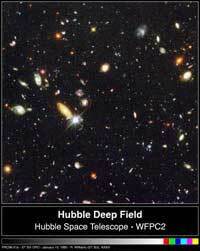 Herschel also looked beyond our Milky Way Galaxy, much deeper into space and time, studying remote (very old) galaxies of our universe, providing information for infrared astronomers to determine how galaxies are born.